An extra special thanks to EnergyPost for sharing this exclusive interview with us. “Last year has been the busiest year in the history of Shell Ventures.” Mark Gainsborough, head of Shell New Energies since its inception in mid-2016, is a little bit awed himself looking back on the activities of his group as a whole over the past twelve months. New Energies, which includes the venture capital arm Shell Ventures (SV, formerly known as Shell Technology Ventures, STV) is set up to look for commercial opportunities and help Shell transition from a fossil fuel company to an “energy” company fit for the future low-carbon world. It has a budget of $1 billion to $2 billion a year on average up to 2020 to develop new activities in renewable energy, cleantech, digitalization and alternative transport fuels. In the last two months alone, Shell New Energies made four investments – in Sonnen, the German home storage developer, HyET, a Dutch hydrogen compression specialist, Axiom Exergy, a thermal storage specialist from the U.S., and in GI Energy, a U.S.-based developer of microgrids and distributed energy services. What is all this leading up to? “We have a long-term objective to create a material position for Shell in the power value chain”, says Gainsborough. How would you describe the standing of New Energies within Shell? What about people higher up in the organization? Do you have specific targets that you have to meet? Will you ever be able to make the same kind of return on investment in alternative energies than as in oil and gas? New Energy Challenge – startups can still join! For the third time, Shell is partnering with startup “incubators” Rockstart and Yes!Delft in the Netherlands to organize the New Energy Challenge. This is a competition for European startups offering innovative, low-carbon energy solutions. The winner will receive a €100,000 grant and warrant from Shell and will be able to work with Shell Technology Ventures for a year to develop its business. Two other winners will be able to enter the accelerator programs of Rockstart and Yes!Delft. Attention: the competition has just opened! Deadline for entries is 23 July, so there is still time for startups to join. The top-10 finalists will be invited to join the finals week from 14-18 October in Amsterdam. At the final event on 18 October the finalists will make their final pitches and the three winners will be selected. “The New Energy Challenge is a great way of bringing very early stage companies together”, says Mark Gainsborough, Executive Vice-President of Shell New Energies. But does Shell have the right skill sets and strengths to be successful in the electricity sector? Do you see New Energies staying an integrated part of Shell? Or do you think it could grow into a standalone business? What do you look for in startups? Sometimes you invest in them, sometimes you buy them. What is the thinking behind that? Is it clear to you where the best opportunities lie? Or are you still in an exploratory phase? Where does an initiative like Shell’s New Energy Challenge (see box above) come in? NewMotion, Europe’s #1 EV charging company, was bought by Shell last year. Do you see synergies between the new companies you are investing in? The company has six onshore joint venture wind farms in North America, one offshore wind farm in the North Sea, and it is part of a consortium developing a new 680 MW offshore wind farm (Borssele) off the Dutch coast. Shell has also invested in UK startup Kite Power Systems, which uses kites to generate electricity. Shell is an investor in Glasspoint, which is building a solar thermal plant in Oman. The company is also building solar power systems for its own use at facilities in California and The Netherlands. Shell is building one of the Netherlands’ largest fields of solar panels – with some 55,000 solar panels — at its chemicals plant in Moerdijk, the Netherlands. In Germany, Shell is part of a consortium installing a network of 400 hydrogen fueling stations (230 Shell branded). Shell Recharge offers fast-charging services for EVs at Shell petrol stations. 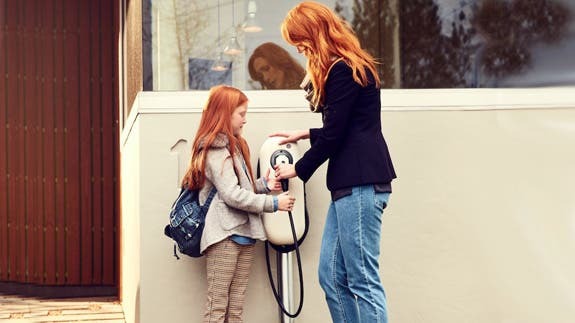 Shell also has an agreement with Ionity, which offers fast-charging in 10 European countries. In the digitalization area, Shell has invested in German startup Tiramizoo, in home energy monitor Sense, in knowledge platform Manaa, and in two apps for drivers, Farepilot in the UK and Fitcar in the US. Shell is also a large power trader in the US and increasingly in the UK and Europe. Shell has a biofuels joint-venture in Brazil, Raizen. In Bangalore, India, the company is active in advanced biofuels Shell also offers GTL gas-to-liquids and liquefied natural gas (LNG) in the transport sector. So how long do you think it will take before New Energies becomes as big as existing divisions in Shell, such as refining or exploration and production? But you have no doubt you will stay on this course?